I have not been intentionally ignoring you guys. I promise. Work is crazy-nutso busy this week and there has been little time for kitchen playing. I’m going to make up for it today, because this recipe is a triple-duty treasure that works as a side dish, appetizer/finger food, and for breakfast (stay with me on that one). I made this for a baby shower my bookclub held for one of our members last night. We had appetizers and desserts (Georgetown Cupcakes–mmmmm!) in potluck style. Easy and cheap for everyone, and really a lot of fun to see who made what and enjoy so many different flavors and textures. This recipe worked because you can pick up the stalks with your fingers and eat them that way, or cut them into bites and use a fork (if you’re all civilized and stuff). It’s very low fat, very high in vitamins, and quite delicious with the sweet vinegar and the sour lemon playing very nicely together. I sprinkled these with Parmesan. I suggest you skip that. The cheese became a gloppy mess, to be quite honest, and didn’t bring much to the flavor party. I did, though, serve them with Prosciutto on the side for those who eat it (I don’t), and people seemed to enjoy the combination. Apppetizer–check. They’re a great side dish for roasted chicken or steaks. I’d even go so far as to serve these alongside a light summer pasta dish, and they’d be great with fish too. You can, if you wish, cut the stalks into bites, roast them that way, put them into a bowl, and serve them as a traditional vegetable, or pop it in the fridge for a few hours, toss it with Parmesan at that point, and put this out as a salad–sesame seeds would be a lovely addition to that. And breakfast. Y’all, I diced a few stalks up this morning and tossed them into a pan with some onion and a touch of butter, let them all soften, and then made an omelette with them, eggs, and a little cheese. Delish, delish, delish. Highly recommend. They’d work in a frittata too, with some onion and tomato. Preheat your oven to 425 degrees while you spray a baking sheet with olive oil or cooking spray. 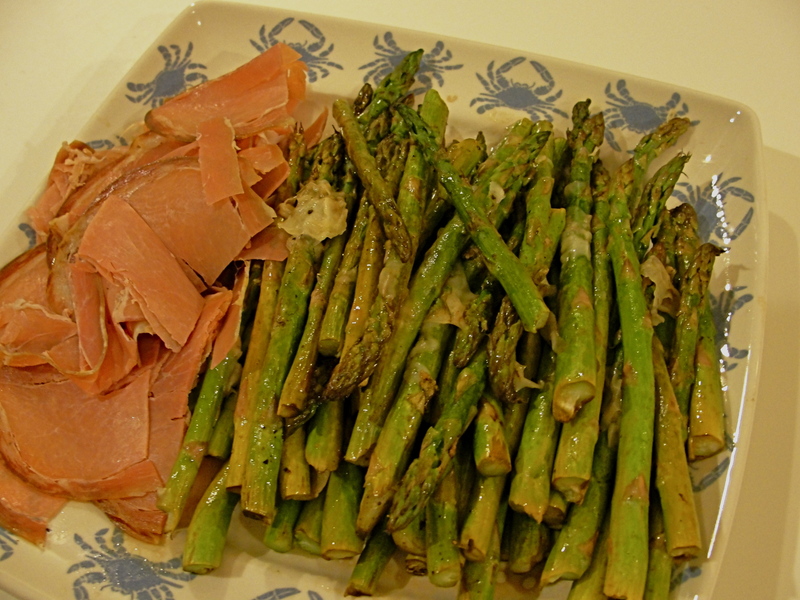 Lay the asparagus spears on the sheet. Drizzle them with the lemon juice, balsamic, and enough olive oil to coat, and toss with your hands to combine everything. Pat them down into a single layer, and roast for about 10 minutes, turning once. You’re looking for a bright, bright green color out of them–don’t let them go any farther than that or they’ll mush up on you. Serve hot or at room temperature as an appetizer or side, and cold as a salad. You know that point when your kids are big enough to have opinions but small enough to not be able to back them up very well? We were at that point when I introduced chicken parmesan as a regular meal. I didn’t want to hear the complaints and see the turned-up noses at something new, and so I did something nobody ever tells you that moms do routinely. Yep, there it is. Out loud, in print. I tricked my children into eating this dish. 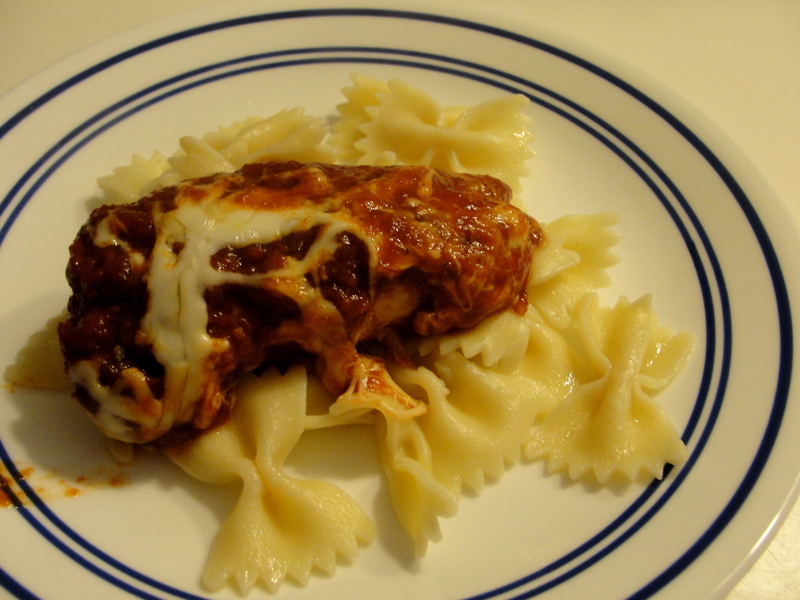 I did that by calling it “pizza chicken,” which it remains in my house to this day. It worked, too–their little eyes lit up and they gobbled it down. I gave up the Mother of the Year trophy for another year, but they ate the food without complaint. I win. This is a very simplified version of this dish, and moms like it because there is no breading (gluten free Chicken Parm, gang! ), no frying, and nothing bad for you in here. I made this version up on the fly last week on a day when I had only my pantry ingredients and 10 minutes to get dinner ready in the middle of the day, before it was all go! go! go! until dinnertime. Everyone ate it. Without complaint. Score! 1 cup Italian-blend shredded cheese, or plain mozzarella with some parm thrown in. In a large bowl, whisk together the sauce and paste and garlic. Stir in the Italian seasoning and balsamic vinegar. Spray your slow cooker with olive oil spray. Put about 1/3 of the sauce mixture in the bottom of the crock. Lay the chicken on top, cover with the rest of the sauce, and cook on low 6-8 hours or high 3-4 hours. Fifteen minutes before serving, sprinkle the cheese on top of your cooked chicken. Turn the pot to warm if you can (low if yours doesn’t have a warm setting) and set the lid ajar to let steam escape. Take the lid off completely about 10 minutes later, turn the pot off, and let it sit for a few minutes before serving. Today’s tip is pretty simple, but I’ve seen enough people ignore it to think that maybe it hasn’t been explained before. So here you go. Heat up your pans before you put any food in them. I know. You do. But if you’re having food stickage or a sad lack of crunch when there should be some, or your searing isn’t quite restaurant-quality, the chances are high that your pan wasn’t hot enough when the food hit. Assuming you’re using something other than a Teflon nonstick pan (which should never be preheated over anything hotter than a medium-low flame, lest what some believe to be toxic fumes permeate the house), your pan should be good and hot when the food goes in. That’ll give you a lovely sear, a delightful crunch, and a great cook-and-release feature that simply lets your yummies go once they’re golden brown and delicious. Turn on your burner while you chop and prep your food and let that pan heat up. You’ll spend less time waiting for your food to cook, less time cleaning up after dinner, and you’ll have more fun and yummier meals. 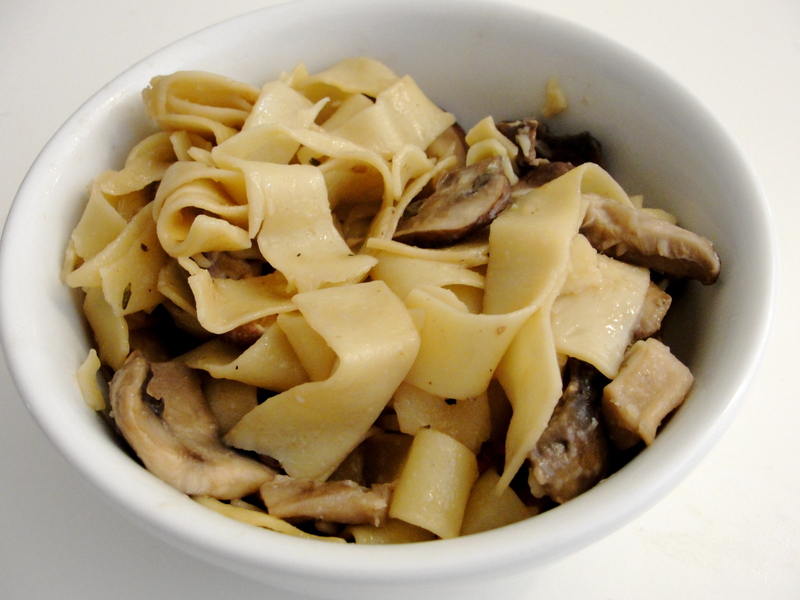 Pappardelle noodles are the world’s ultimate comfort food. I swear. Think egg noodles the length of spaghetti and you get the idea. They’re soft and delicious all on their own, and I’m so glad to have recently discovered them in a grocery store near me, right there with the regular pasta. 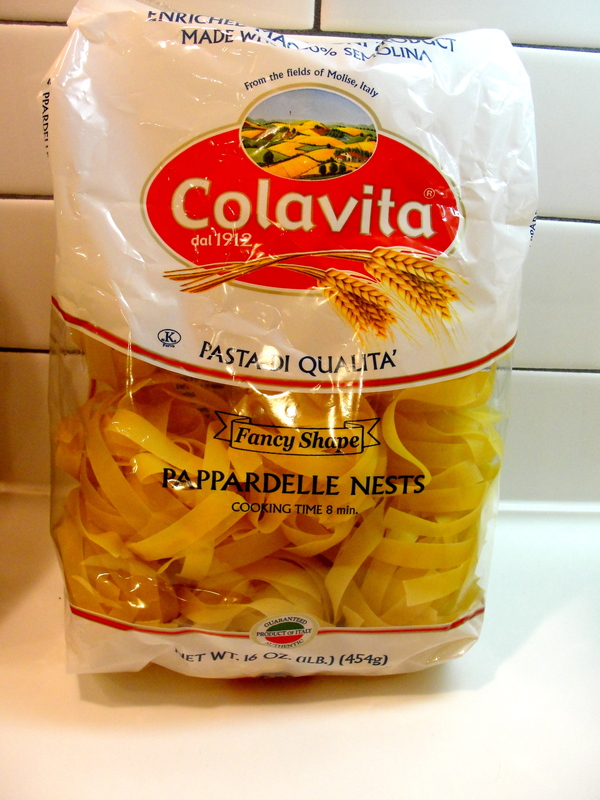 They come in these “nests,” but they cook up just like normal pasta, and they are totally worth searching for. This recipe started out as one by Jamie Oliver that sounded really good. I cooked it up and happily doled platefuls out and took a bite…and looked at DH. It was fine. But only fine. It needed something. DH tried hot sauce. Not the answer. We talked about adding grilled chicken to it, but the point of this is that it’s a healthy meat-free meal that satisfies (we’re trying to eat less meat, both for our health and our budget). Adding meat to it seemed to negate the point. I went into the kitchen and messed around a bit, and found something that worked pretty well. So this is written to include that–you get a delicious, beefy tasting sauce on this that’s not too heavy and still lets the mushrooms and the Pappardelle shine through. This has butter in it. Please use it without guilt. Butter is not a bad thing–your grandparents and mine all lived their whole lives eating real butter with almost every meal. Everything in moderation, my friends, and when you take into account the fact that this makes six hearty servings (eight with a side dish or salad), you’re not eating very much at all per meal. In a large pot of salted water, boil the Pappardelle until they’re nice and tender, about 8 minutes. Drain. In a large skillet (I used my wok), over medium-high heat, saute the onion and garlic in the olive oil for about two minutes. Keep it moving so the garlic doesn’t burn. Add in the mushrooms and saute for about 2 to 5 minutes, or until they start to release their juices in the pan and turn a golden brown color. Salt and pepper and give them one more good stir. Add in lemon juice. Stir together stock and cornstarch or arrowroot until it’s smooth. Sprinkle with oregano and thyme. Stir that into the mushroom mixture and cook, stirring constantly, until it thickens up, about 2 minutes. Melt butter into the mushroom sauce. Pour that over the noodles, toss with Parmesan, and serve. I started Friday thinking we’d have Shrimp Pad Thai for dinner. As the day went on, thought, I realized something. I just wasn’t in the mood. It happens, right? You meal plan and shop and prepare, and then at the end of the day, you’d just about rather eat anything other than what’s on the menu. The beautiful thing about being a grown-up, of course, is that you then get to decide whether to stick with the plan or move along to something else. I won’t tell you about the night DH and I had ice cream for dinner simply because the wait was too long at our favorite restaurant and we just could (*ahem*), but there are perks to being taxpaying, crazed adults. I didn’t want to waste the shrimp I’d defrosted, and I didn’t want to let my green onions to go waste. A quick search found a lo mein recipe that worked, except that it had a bunch of stuff in it that I either didn’t have (red peppers, fresh ginger, and a bunch of other stuff) or people here wouldn’t eat (carrots). So I improvised with what was in the pantry and my freezer. Which is another huge perk to being an adult. It’s playing with your dinner, yes? Playing is fun! This turned out well. I loved it. DH would have liked it more had the sauce been a bit more subtle, but he’s a subtle sauce kind of guy. The kids had some without comment, which is a victory in my book, and it was even better the second day. That said, I recommend it for a quick meatless meal. I did eat this so fast that I totally forgot to take a photo–mea culpa. In a large pot of salted water, boil spaghetti noodles until they’re on the tough side of al dente. Drain. In a wok or large skittle, cook the onion, garlic, and green onions in the sesame oil over medium-high heat until you start to smell it–two or three minutes. Add shrimp and broccoli (I tossed mine in still frozen) and cook until the shrimp are about done and the veggies are softening a little. Stir together cornstarch and the broth in a small bowl. Add that mixture to the wok and stir gently until it starts to thicken up, about a minute or two. Stir in the remaining sauce ingredients. Once everything’s combined, pour your spaghetti in and stir it all around over the heat, letting the noodles finish cooking in the sauce. Enjoy. My son and I take Taekwondo on Thursday nights. Class starts at 6:15, which means if we want dinner before 8:30 and don’t want to feel sick after 90 minutes of kicking, punching, push-upping and jumping around, we eat around 4:45. That can be a challenge, quite honestly, with school pickup at 3 and homework after that, and a generally-filled daily work schedule for me. This weekend is Pinewood Derby with the Cub Scouts (my favorite kid event of the entire year–LOVE me some Pinewood Derby! ), which takes up Friday night and much of Saturday. And it’s Lent, which puts us on a no-meat restriction for tonight. Why do you need to know this? Because it all came into play when I was meal planning earlier in the week. I knew I wouldn’t have much time Thursday to cook, and I knew I’d want whatever we ate Thursday to carry over into Friday, and so then that had to be meat-free. Complicated? Maybe. But knowing it ahead of time made it simple for me to shop with a list earlier in the week and get all the ingredients for a huge pot of shrimp lo mein, which I whipped up in about 15 minutes during homework time on Thursday, and will feed all of us tonight, too. And that, my friends, saves me a lot of time. Meal planning is critical, I think, for families. It’s especially important for families whose adult members are running around like lunatics all week (that’s most of us, yes?). And sitting down with a day-planner and your recipe box at the same time helps avoid chaos on hurricane days. You know that you have X on Thursday and Y on Friday, and that your meals will be affected, and so you can plan, shop, and cook accordingly. I really thought about whether to post my favorite recipe for soda bread, since every blog on the planet seems to have already posted one this week. I’m doing it first, because this is a really good, super easy version of the obligatory Irish bread, and second, because I’m afraid not to. I am, you see, the granddaughter of one Mary Agnes McCann, and she was exactly as you’d picture her: full of fire and vinegar with red hair and blue eyes and a devious streak a mile wide. St. Patrick’s Day was akin to a holy day of obligation in her house, and I am afraid she’ll haunt me (not in a good way) if I don’t let you in on this bread. This is ridiculously easy, but you really should make it the day or night before you want to eat it. DH attacks it the moment it appears from the oven, so that’s OK too, but I prefer to let the flavors meld together overnight and have it for breakfast the next day. 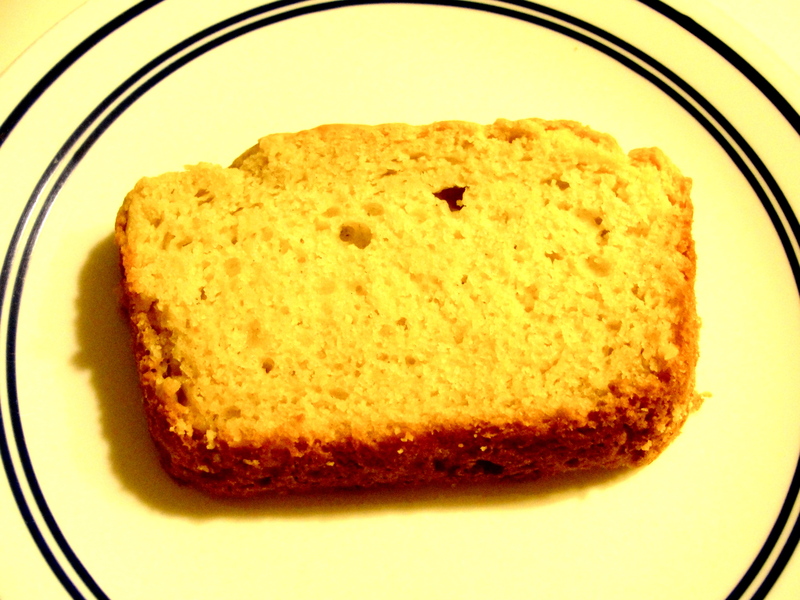 There are no currants or raisins in this bread. See that Mary Agnes McCann thing up there? Right. No raisins. Just bread, filled with buttermilk, as it should be (soda bread was originally meant to use up all the sour milk in the house in the days before refrigeration). If you don’t have buttermilk, put two tablespoons of white or apple cider vinegar or lemon juice in a measuring cup, and then fill it to the two-cup mark with regular milk. Let that sit 10 minutes and add it to the recipe. It’ll work just fine. I can’t remember where this one originally came from, but I have messed with it a bit, so we’ll call it mine. Preheat your oven to 325 degrees and grease a standard loaf pan. Whisk together dry ingredients. Add in egg, buttermilk (or substitute) and butter, and mix together until it’s just combined. It’ll be lumpy. Pour it into your pan. Bake about 70 minutes or until a toothpick comes out clean. Cool and wrap tightly.